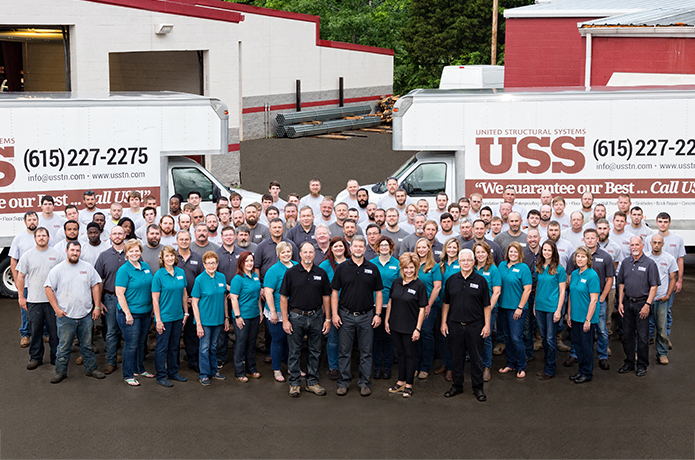 USS has been protecting homes in Middle Tennessee and Southern Kentucky for 25 years. We guarantee our foundation repairs for the lifetime of the houses we service with our quality workmanship. Contact us today for help with your foundation repair, waterproofing, and concrete leveling needs. Prevent cracks in bricks and walls from becoming bigger problems. Seal basements and crawl spaces and divert water to preserve foundations. Lift up patios and walkways to avoid costly slab replacements. From Our Blog, "On the Level"
USS is a family-owned and -operated foundation repair company founded in 1994. Since then, we’ve helped over 15,000 satisfied homeowners throughout Middle Tennessee and Southern Kentucky restore their homes. Customer Satisfaction Is How We Measure Success. Very professional company from Customer Service: Anna, Valerie, and Michele, to the crew: Derek, Tyler, and Josh, and best Project Manager Chris Crockett. They treated me like family over the past 6 weeks. Nothing but best service anyone could ask. I have nothing but Awesome things to say about USS and their employees very easy to communicate from the phone to emails of every step of the process! Great Job! I got 4 quotes before choosing USS concerning brick and mortar settling cracks. Matt and his crew just finished their work. I couldn’t be more pleased with this company, their process of repair and the hard working, diligent crew. Thank you.